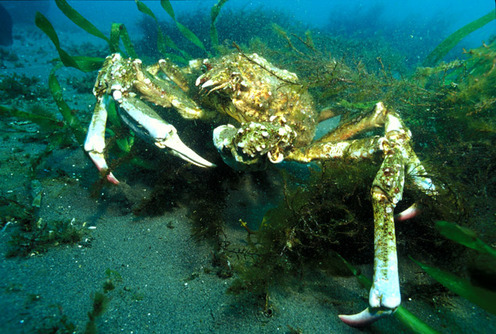 A sheep crab erupts from its home in an eelgrass patch. 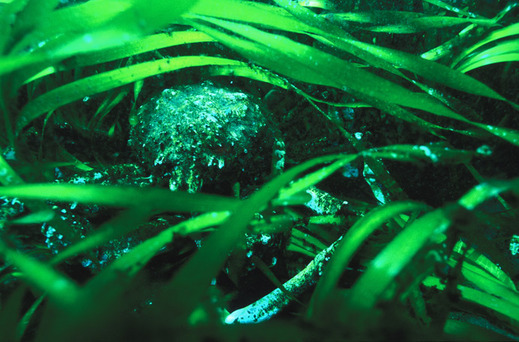 A sheep crab sits in eelgrass. Although they look somewhat like robotic Mars rovers, sheep crabs don't have a lot of personality. My impression is that they tend to be sour. 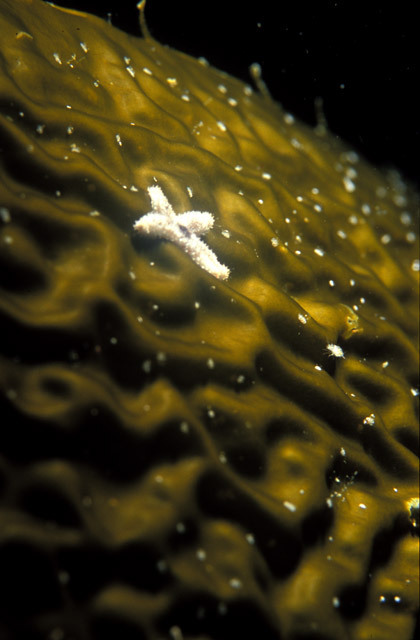 Charles Darwin wrote, in Voyage of the Beagle: "The number of living creatures of all Orders, whose existence intimately depends on the kelp, is wonderful. A great volume might be written, describing the inhabitants of one of these beds of seaweed. Almost all the leaves, excepting those that float on the surface, are so thickly incrusted with corallines as to be of a white colour. 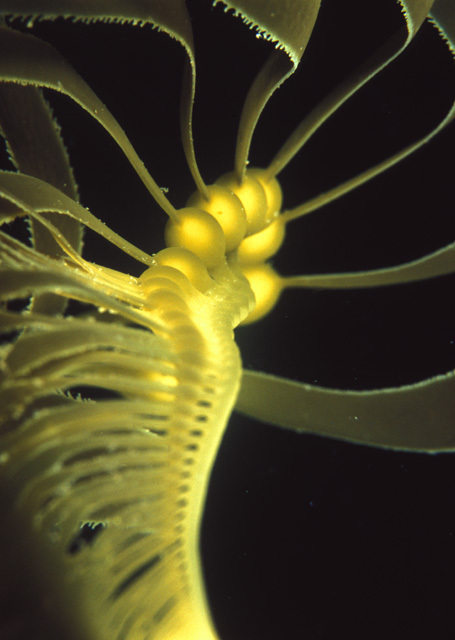 We find exquisitely delicate structures, some inhabited by simple hydra-like polypi, others by more organized kinds, and beautiful compound Ascidiæ. " These blades of macrocystis kelp were floating near the surface just west of Bluebanks, on the south side of Santa Cruz within sight of the radar towers above Yellowbanks. The water's surface divides sunlight onto the blades. I'm not sure of the role of the jagged edges of the blades, but evolution must have decided that this is the best shape for a kelp leaf! A field of macrocystis can absorb nearly as much carbon dioxide as a field of alfalfa in Puerto Rico. Perhaps that alfalfa field holds the record; it seems to be the standard. Stop global warming, go kelp! Macrocystis kelp at Cathedral Cove, Anacapa. Macrocystis develops new bladders by splitting old blades; each piece develops a new bladder, and becomes a blade in turn. Sizes of the blades are related by some ratio; I wonder what that ratio is! The bladders are usually said to be full of air or gas, but it's hard for me to believe that they aren't full of oxygen, the product of plant metabolism. Charles Darwin wrote, in Voyage of the Beagle: "There is one marine production which, from its importance, is worthy of a particular history. 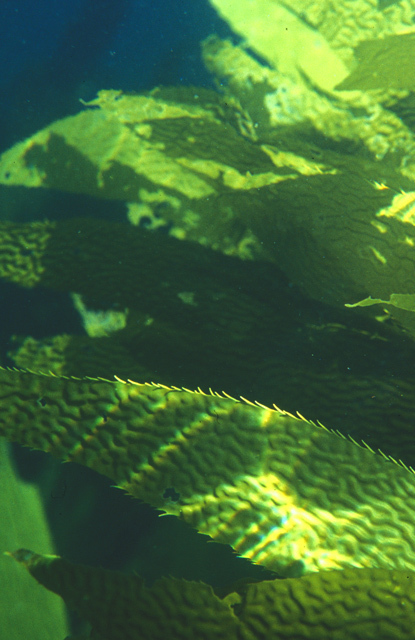 It is the kelp, or Macrocystis pyrifera. ... I know few things more surprising than to see this plant growing and flourishing amidst those great breakers of the western ocean, which no mass of rock, let it be ever so hard, can long resist." 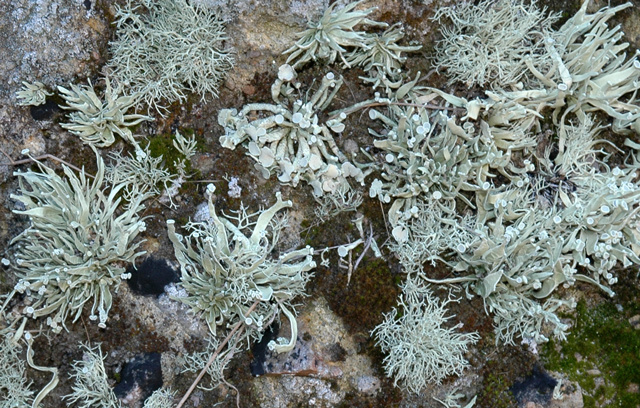 Lichens in a small canyon among the torrey pines near Becher's Bay, Santa Rosa Island.